Hey guys, Brandi Bolden here. I have a super exciting question to ask y’all. As you may have guessed from the title, that question is about Ilona Andrews merch. Yes, I know, I’m happy dancing too. What exactly do you want to see become available as merch? I need you all to write to my personal email and tell me! Tell me which quotes you want and what kind of items you would like ( ex. hoodie, tee shirt, tote bags. )You can also write it in the comment section. Write your suggestion as a comment, and if you like somebody else’s comment, you can reply to it with +1. I included my email in the post, but just stop be safe it’s brandi.bolden202@gmail.com. Or Maud’s blood sword – though getting it to “whine” and light up red round the edges could be a challenge. I’ll go with any edged weapon from any of the books. I’d like to know as well, is there any official retailer? +1 to the turtle crossing… But on a t-shirt. +1 and I thopught mugs were all I wanted. any wilder looking lion available? that wee one has to be da big guys kid. +1 for me and everyone on my Christmas list!!! I would love a medium size tote bag! And maybe a stuffed lion to go with! Also where would these things be available? I would love a t-shirt that says, “Here Kitty, kitty” on it. And I also would just like to add that I’d love if y’all included sizes up to 3x. I know a lot of merch isn’t available in women’s size 3x but I’d buy a sh*t ton of Ilona Andrews merch if y’all carried it in plus sizes. +1 on the plus sizes! +1 on plus sizes. Men buy tshirts, etc. where they don’t buy other stuff, and I can assure you more if them come in big sizes than they do med. or large. A t-shirt or set of t-shirts or hoodies sounds great! +1 on “here kitty kitty” AND extended sizes!!! Someone has probably posted a desire for this earlier in the comments but I cannot read all of them. Too many! Anyway, I’d love a shirt for the werewolf mercenary convention. I’d really, really love it! I personally never laughed more than Hardwares comments about who would fuel an engine using an un renewable resource…There are some great quotes there,in that section of Innkeeper Two…..esp concerning Fossel Fuels…..
On a tee is good…..
Granted I drive a Volt and my husband drives as Tesla….. Thank you so much for deciding to put out merch. I love wearing and having merch from my favorite books and can’t wait to have Ilona Andrews merch. I suggest embroidery patches, military unity style, like soldiers wear on the shoulders of their uniforms. I would love to put an Iron Dogs patch and Sgt Teddy patch on my hiking gear. Also patches for PAD, The Pack, Cutting Edge, Red Guard, etc. Anything with business logo for Cutting Edge (something with a sabre), Sgt. Teddy (sergeant stripes with a bear paw?) and the Iron Dogs crest (it is mentioned at the end of “Magic Rises” when they march into the hall and in “Iron and Magic” a crest is placed in their new barracks). An Iron Dogs zip-up hoodie or sleeveless shirt would be great to wear to the gym. On the front chest could be the Iron Dog crest and on the back “Thank you, Preceptor!” or “If you fall, the rest will shield you” written under another larger crest or image/silhouette of the type of dog Hugh plans to breed for war dogs and “1st Cohort” on the shoulder. Please include larger sizes in clothing, like men’s 3xl. I think the patches idea is the best one I’ve heard! +1 Patches of company logos/emblem like Cutting Edge or Iron Dogs is a great idea. +1 on Iron Dogs Hoodie..
For KD I’d like a shirt or tote bag that has a sword and a shield and says “Mercenary Guild of Atlanta Our Swords Could Be Your Shield” or whatever creative slogan the author lords come up with now that Barabas is in charge of marketing. I’m thinking going around it like a old school fireman’s symbol with the axes? House Baylor crest on a tote? You get the picture. I would buy posters or t-shirts, coffee cups, keychains with those images. 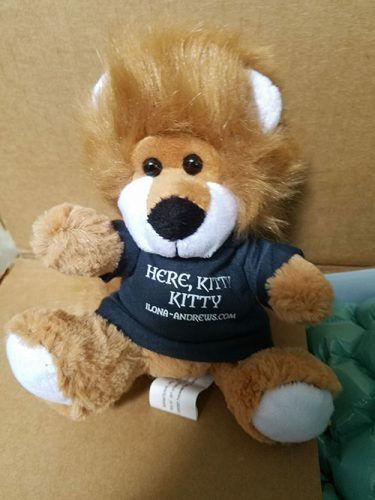 Liked the Here Kitty Kitty shirt but I would like it on a gray lion instead. Absolutely a grey lion. And maybe a black one with wings, but bigger than the grey one. And anything with “Here, Kitty, Kitty” on it. Too cool!! Omg yes. I would give t-shirts with that to all my grand daughters! The quote with a picture of Maude (and Helen?) in armor! And of course I’ve just realised that a T-Shirt with just a House Krahr crest would be pretty awesome too. I think there’s already some artwork for that floating around in one of the current or past book chapters somewhere. A t-shirt with a silhouette of Kate’s giant donkey horse and her feeding it something so you have some for scale/ perspective. Stuffed Conlan and Orro. I would also love an Innkeeper cookbook. Can you persuade Orro to co-author with Dina? Would love pens of the sort one picks up at hotels and B&Bs with a Gertrude Hunt logo. I love socks with embroidered pics so there could be ones with the different shifters and characters that change in either of their forms, plus quotes. My idea is for the AuthorLords to have a Design Contest for the Crests, Quotes, and Fan Art. There are a lot of talented people following this blog who would gladly submit their original artwork in exchange for merchandise and bragging rights. Set the parameters ie size, number of colors, shape/area for the crests/artwork based on it going on a mug, tee, calendar, zipper hoodie… etc. Due by a certain date at midnight. Your submission is permission. Then release a new ☆limited product line☆ based on a Series every other month. It would be a win-win-win to have the graphic/art work done by *talented fans *who are familiar with the franchise and *passionate about seeing their beloved characters come to life. Good Luck with the merchandising! This would be way cool and save you some trouble. Even better if the winners actually get PAID for their work. And non-winners automatically keep the rights to their submissions too. Fan-contests like this can be very exploitative. ☆I’d like to see knee length Gertrude Hunt calico rose pajama tees with the GH logo on the outside pockets. ☆ A warm fuzzy GH reading day robe with outside pockets big enough for an AL paperback book/ cell phone. Going through Hidden Legacy for about the 4th time right now, audio book, & this one makes me laugh out loud every time. +1 ooooh yeah, that’s a good one! It ismyfavourite series of all time, too. I lost count of how many times I’ve read it – probably 6 or 7 times. So excited about Saphire Flames!!! (which’ll give me an excuse to reread again 🙂 ). I would like a T shirt of the “Iron and Magic” cover. I’d like the early prospective cover for Diamond Fire. The one with a more sharply defined magic circle and a cityscape in the background. Way better than the one finally used, though the theme is the same – the first one is a lot grittier. Ohhh socks!!! With lions, swords, logos of the books . Matching socks and teesand hoodies and pants . Are you sure you want to do this, this seems like a lot of work? But you will have lots of customers, who would happily buy anything from your series. Including me. I think socks are a great idea!!! They already started to sell “reading socks” – thick warm knitted socks you can wear when you read – at Chapters (Canada’s version of Barns and Nobles) and they sold like hot cakes even if they were >25$ CAD. Thanks to climate change, people now not only love those, they need them! Anyways, I thought the ones they sold at Chapters were really plain and boring – pink with snowflakes *shudder* – so I’d really go for reading socks with references to my favourite books! How cool would that be?! Love the idea of a hoodie with nothing or a small “Hidden Legacy” on the front left chest and an arcane circle or similar design on the back. I’m more likely to wear something that isn’t super in-your-face. Pack sweats, reusable grocery bags, and sterling silver jewelry also sounded great! +1 Would totally wear a gray hoodie with Hidden Legacy arcane circle on the back, skip the words on the front. +1 Pack sweats!! Sweat pants for life. Or book bags! Fridge magnets was also mentioned earlier. Car decals or stickers would also be cool! Often wrong but never in doubt is my go to phrase. A shirt or hoodie. A book bag that says BDH would be great. A shirt with Hidden Legacy would be intriguing. +1 on hoodies for often wrong never in doubt and a hoodie with just the letters BDH in smallish print on the left front breast area and possibly a graphic of a dragon (or lion?) eating a book on the back. I’d love to see some anime/graphic art versions of characters, or battle scenes on t shirts and travel mugs. Might even be cool to use some fan art? Or if you want to go a bit more badass: “Don’t annoy me … there will be ripper cushions”? Ripper cushions on a pillow. I’d like to have notecards with scenes of Gertrude Hunt’s elegant ballroom, Hiru room with revealed Hiru, exterior of GH seen through blossoming apple orchard. Tag line – Welcome to Gertrude Hunt, Red Deer, TX. A cup or tshirt that brings together all the series: legend, Here Kitty Kitty then in one corner Curan, another corner Jack (The Edge series) and, from the Primes, there’s an Animal communicator Prime and his daughter, Mathilda – Matildha has a kitty, and I think her father bonds with/tames one of the big cat creatures that also defends Mathilda. I always thought those shirts where you had the whole book printed super tiny were pretty nifty. Maybe in the shape of a lion for a Kate book, and in the shape of a wolf or house for an Innkeeper book. Hidden Legacy is a harder shape choice- maybe a gem necklace? Or a gun and a steel beam… Lol. I would *love* a litographs type shirt of the books. Charm bracelets. Could offer a core bracelet and then aspects of several different series. A replica of the family photo Dina keeps. Replicas of any of the weapons, although they’d be expensive and tricky to make, I’m sure. A universe based Innkeeper map/poster. A jewelry box based on the box from Magic Triumphs. The magic only inscription could be glow in the dark. Any kind of themed woven blanket/throw. There’s so much to draw from! Ok, I’m out of ideas for now. Jewelry! My favorite thing is to wear something subtle that I know is from a fandom but unless you’re in the know it just looks nice. Its how i find my people in corporate America. If you correctly spot my golden snitch necklace, odds are good we will be friends. Signed bookplates (preferably personalised) to stick in the front of my books. Bonus if it’s got artwork from the cover of the book/s. Not living in USA means difficult to get book signings. Poster map of post shift Atlanta would be interesting, could also be used at inner page on a notebook or journal. A planner or diary (undated) would be interesting with quotes, maps, character bios and general snippets or random facts that don’t make the final draft, series reading order, etc. Book release dates could be included if they are fixed dates. Themed charm bracelets, you can find some nice ones on etsy for inspiration. A blank journal that says nobody thinks to check the dead tree books anymore.